Not far from the entrance of Nusantara Flower Park (Cipanas, West Java, Indonesia), you’ll see this flower carpet display. Most of them are Celosia flowers. Very colorful! Beautiful, Lina. Are they blooming now? Kayaknya kemarin masuk tipi itu mbak Lina tamannya, dan memang bagus sekali ya? Oh wow, that's a heavenly sight! That is awesome. 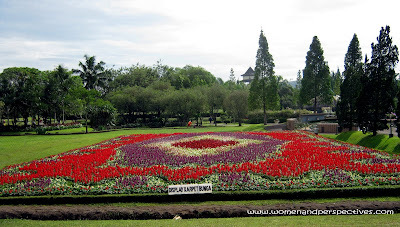 We have a flower park to visit here that also has sweeps of flowers such as this to see. Its beautiful! Such a wonderful park! The patterns are gorgeous and colourful. What a lovely display of flowers. Great photo. Thank you for sharing the wonderful gardens. spectacular...I love the formation...awesome shot lina...thanks for sharing!